The podcast player is at the bottom of this article. 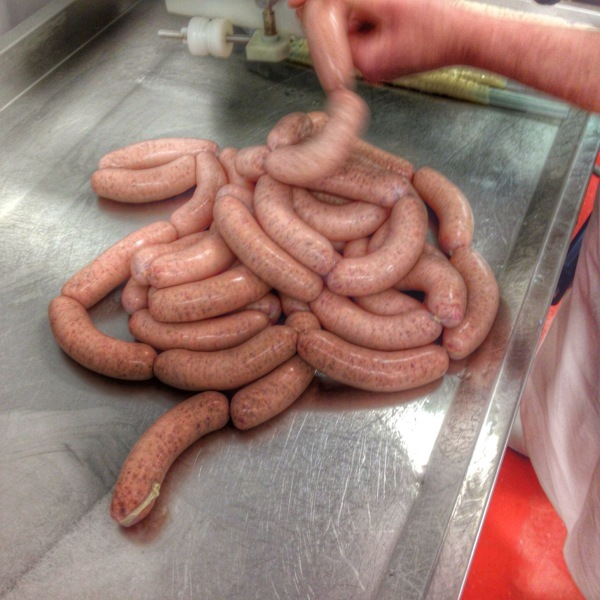 Crombies of Edinburgh have been making sausages since they started three generations ago but in the 1980s, spurred on by winning a key sausage competition, they decided to really develop their sausage range and it’s been growing and winning awards ever since. I couldn’t wait to visit! 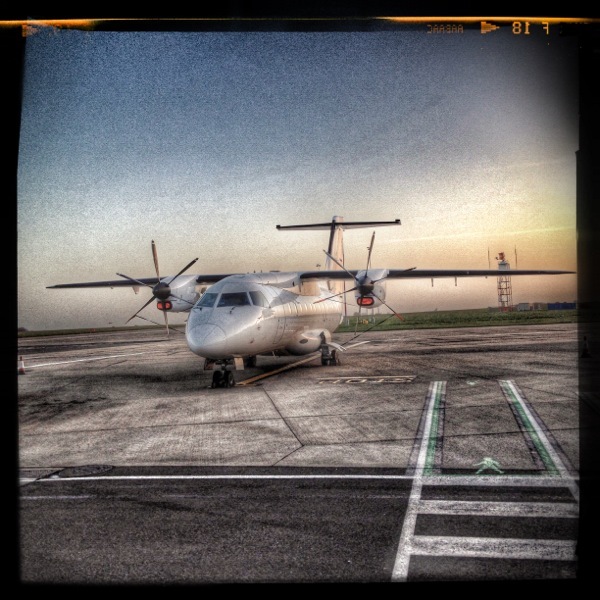 Our local airport in Norwich offers direct flights to Edinburgh so I got myself up to the airport! We made great time to Edinburgh despite the headwinds and I was soon heading down to Crombie’s shop. As usual Edinburgh was looking stunning! 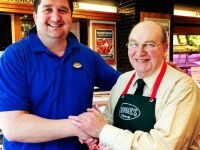 I was delighted to meet Sandy when I arrived at the shop, it was his Dad who set up the shop, his sausage enthusiasm was evident immediately! There are 35-40 different varieties on offer in the shop including some truly innovative flavours. Sandy took me down to his production facility where the sausages are made and I was very pleased to meet his team. They share Sandy’s enthusiasm for good food from great suppliers and are genuinely passionate about what they do. I had the chance to get involved in making some of Crombie’s recipes. The smells were amazing. Luckily when Sandy and I got back to the shop there were some samples to try! There were some seriously good sausages here, I hardly knew where to start but I managed to! Lamb, rosemary and garlic – this was a really great sausage, stronger rosemary than some and balanced well with the garlic which just perfectly complimented the lamb. So often one or more of the ingredients can mask the others but not so here. Great balance and bold flavours all round. 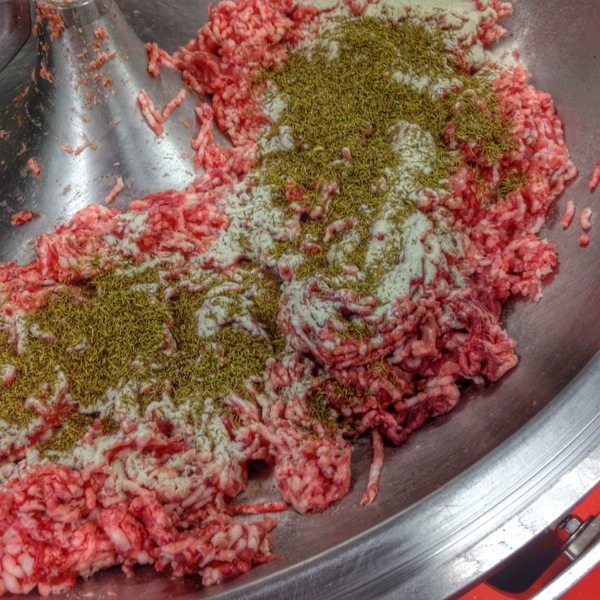 Pork, Leek, Pancetta and cheese – this was another great sausage! It was creamy with the cheese, salty with pancetta with the warmth of the leek blending with the well flavoured pork. More bold flavours balanced well together! Pork & caramelised onion – here there was great balance, a warming sweetness from the caramelised onion creating a heady mix with the well flavoured pork. 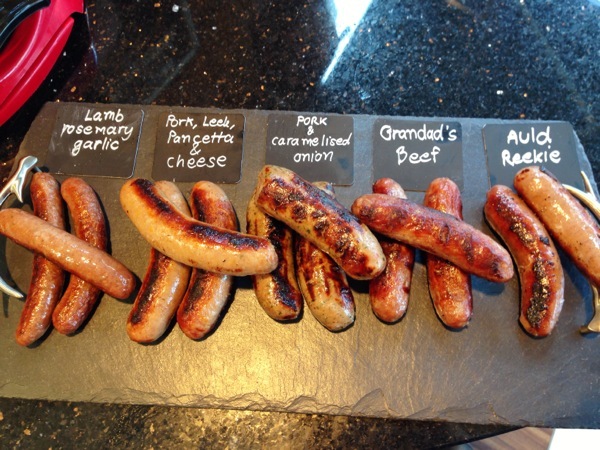 Grandad’s beef – It’s easy to forget that some Scottish butchers have been specialising in beef sausages for generations until you try a classic like this. This was another real wow moment! A great beef sausage with bold flavours coming through but somehow refined and moorish. Very hard to describe just how good this sausage was, I was struggling to remember a better beef sausage. 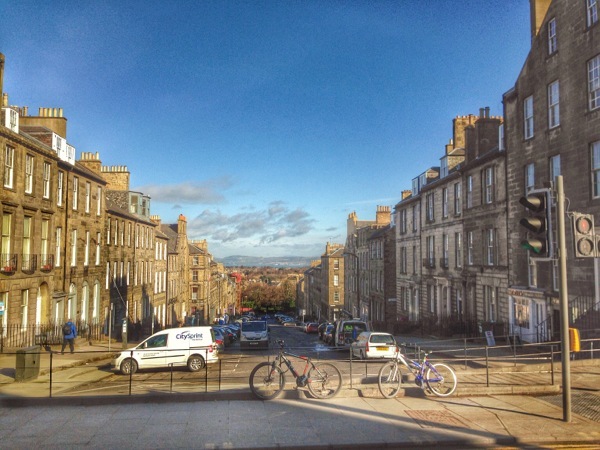 Auld Reekie – You will hear more in the podcast (see link below) about this great sausage. It was a great big character of a sausage with a balanced smokey flavour with meaty pork and beef flavours. It’s a brilliant creation which represents Auld Reekie, Edinburgh, itself. Luckily, before I had to bid my farewells and get on my way there was time to try two more great sausages! 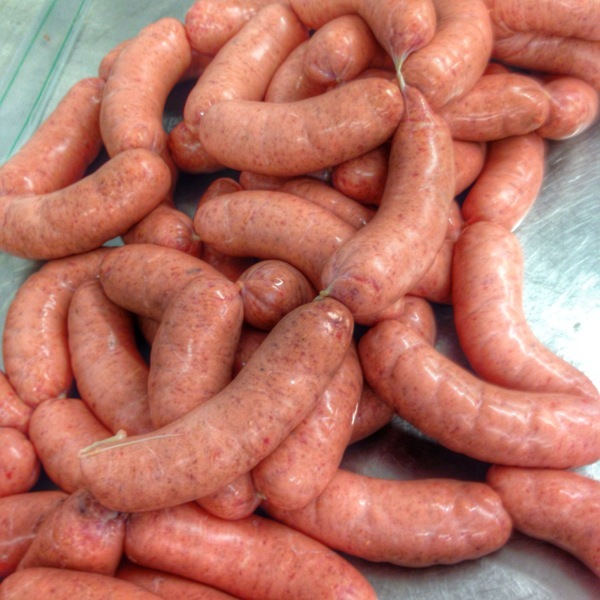 Merguez – a decent merguez is, in my view, an important sausage staple. Crombie’s didn’t disappoint here either! This is a French / Algerian sausage made with lamb and a little pork, red wine and a complex blend of spices and Mediterranean herbs. Balance and bold flavours. Absolutely first rate. I was keen to hear from Sandy which his favourite sausage is. I suspected that, like me, it frequently changes! He said he was really keen on the honey, mustard and pork sausage so, just for the sake of you, the loyal reader, I tried some of those too! Honey, mustard and pork – These were some of the most balanced honey, mustard and pork sausages I had ever tried. With others I have found the mustard can mask the pork and the honey flavours. Not here at Crombie’s! Sandy has a supplier of honey in Northumberland who makes his own honey mustard. This means that the honey flavour is truly throughout the mustard and this comes through perfectly in the sausage. 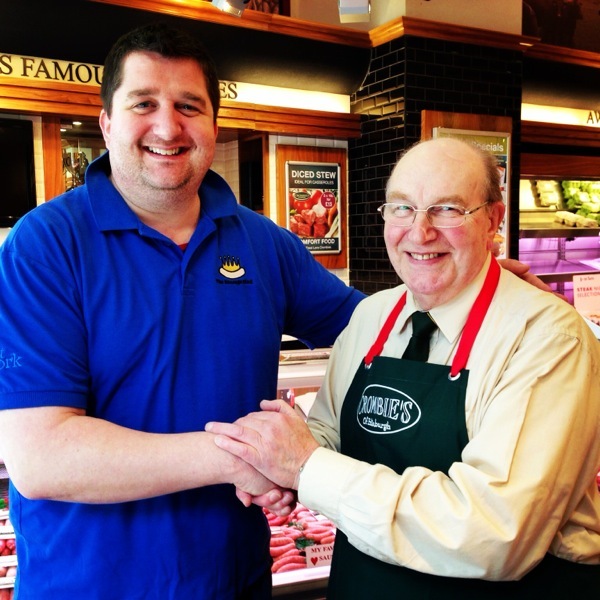 Between sampling the great sausages on offer I also got the chance to interview Sandy and find out a bit more about Crombie’s of Edinburgh. I was delighted to finally have the opportunity to get up to Edinburgh and visit Sandy and his team. Crombie’s have a great range of sausages but they have more than that. They have a real passion for their customers and a real pride in using top suppliers. I recommend you visit as soon as possible!